So, you know it’s great.. how do you get your kids to eat it? Throughout years of experimenting, I’ve noticed a few things that I’ve turned into our top strategies. TEXTURE: My kids like their oatmeal UNDER-cooked! The more you cook it, the mushier it is. We use Quick oats, in the microwave, rather than rolled oats on the stovetop so its less mushy. Try both ways to see which way your kids prefer. Take turns between oat groats, rolled oats, quick oats, and instant oats. FLAVOR: This is where you could try oatmeal a million ways until you find one your kids will ask for every morning. There is always the industry standard, brown sugar. But there is also, chocolate and peanut butter, apples and cinnamon, peaches and cream, key lime pie, coconut berry, pumpkin, and anything else you can think up! TEMPERATURE: Is your oatmeal too hot or too cold? Take a tip from Goldilocks to make sure it’s “just right”. 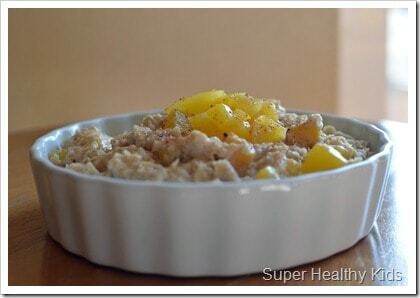 Try our Peaches and Cream Oatmeal to get your family started eating oatmeal today! This delicious oatmeal is a good start to getting your kids to love oatmeal for breakfast. Awesome post! My daughter eats oatmeal at least 3x a week and she loves to stir yogurt into it. She’ll eat the whole bowl! I’m going to try your peaches and cream recipe to give her a little variety. Thanks for the recipe! I was actually thinking of adding yogurt to oatmeal today. I’ve never tried it. Do you cook it like normal, and then just stir in oatmeal at the end? MMMM.. looks amazing! My oatmeal looks ugly after seeing hers! Oh, no. Yours looks yummy. But her’s looks like it’s off of a commercial. That’s the reason I don’t use my pictures of my food on my blog. My camera isn’t good and I have no idea how to take pictures. Your food always looks great and so do your pictures. Why are Americans the only people alive who still believe that fat causes CHD, cancer, Alzheimer’s, diabetes etc.? Instead of the real cause, carbohydrates! I always make my oatmeal with vanilla flavored coconut or almond milk (I learned that from you – thanks!) and add fruit. It tastes so yummy, almost like dessert. My 3 yr old likes it baked, hot out of the microwave and cold (overnight oats). Ohsheglows.com has some great overnight oat recipes! The thicker I make it the better she likes it. 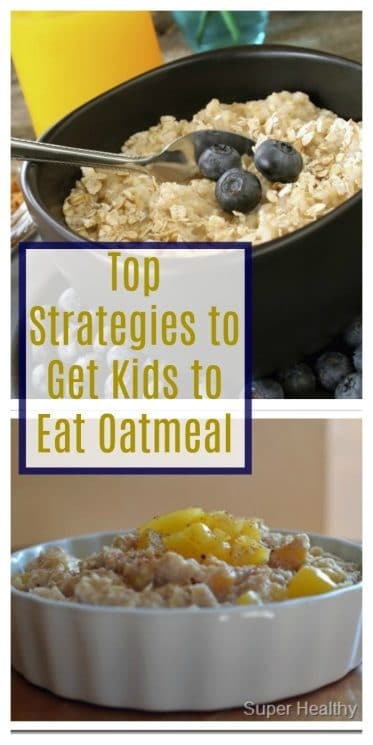 My kids love oatmeal! (3 & 1 years old) We like it best on the stove with frozen blueberries mixed in. Not only are the blueberries super nutritious they help cool off the hot oatmeal. Thanks for the post! “Has Fiber! Kids ages 3-10 need 8-15 grams of fiber per day. Oatmeal has 3 grams per half a cup. I’m absolutely flabbergast that someone might publicly make such ludicrous claims without providing any evidence whatsoever to back them up. I challenge you to provide irrefutable evidence to any one of the three statements above, especially the last one. In reply to your question: I have read many of your blog articles. Most of them dedicated to spicing up one form of carbohydrate or the other (especially refined or fast carbohydrates), in order to make them more appealing to a target audience. I’ve spent years reading the studies, experiments, and hypotheses involved in establishing what constitutes a healthy diet. I have been able to identify each point where industry has influenced the outcome of experimentation, and I am uninfluenced by what popular or media would have me believe. You, on the other hand, have been duped completely, along with the vast majority of the U.S. population today. The evidence lies before you. Today’s Americans are eating low fat, low protein, high carbohydrate diets, and they’re getting fatter! CHD (coronary heart disease) incidence is on the increase, hypertension is rife, and diabetes is epidemic, not to mention the state of the innumerable cancers. The worst affected are the poor, who eat more carbohydrate than the rich, and none of you can see what’s widening your girth…? I don’t expect that everyone will be as well-read on the subject of overweight, obese and diabetes as I believe I am, but is it too much to expect that individuals educate themselves on the basics before advising the population to sicken themselves further by eating this rubbish (fruit-layered oatmeal) and in doing so pushing them further into the body weight abyss? Since you clearly believe that carbohydrate enriched diets are healthy, may I suggest the following reading as a good place to embark upon a journey of broadening one’s outlook on the topic matter of what fuels the body best and how to avoid today’s lifestyle diseases: “Good Calories, Bad Calories.” by Gary Taubes. I sincerely hope that Gary will be able to at least convince you to write more openly on the subject of getting our kids back in shape. The problem is, we could both find evidence that supports both sides, that’s why I choose not to have this debate. Instead, I prefer to promote whole foods, grown from the earth, and not made in a manufacturing plant. That is the way to good health, and the health of our children. Your opinion is that neither side of the argument has proven itself. You nonetheless choose to make statements such as, “Lowers risk for high cholesterol, high blood pressure, and even type 2 diabetes.” That logic in itself is confusing. I choose to believe that the argument was settled in the mid 1900’s. After that, self-serving individuals, governments, and organizations chose to misconstrue the facts. In my own case the hypertension, obesity, and diabetes “went away” when I cut out the kind of food that you promote. Since then my blood markers have remained normal. I have read all of the studies to which you refer, and many more. None of those were conclusive. Many of them were clearly misrepresented. Some were even self-serving. In reply to your questions! I’m not upset by what you say at all. I’m simply flabbergast that you say it. After your latest email I’m flabbergast even more so. Ordinarily I don’t read your blog. I run an app on my iPad that collects health and exercise stories from the Internet for me. It was there that I first stumbled upon your blog. I doubt whether you’ve thought that statement through entirely. Poison ivy, oak, sumac, castor beans, deadly nightshade, rosary pea, water hemlock, oleander, … and many more…. I guess it’s true. I do lean towards the carb side because they taste so good and I’ve never had a problem with my blood lipids, and I’ve been able to maintain a healthy weight with loads of carbs in my diet. Thanks for sharing your story too. I’m glad that you found a diet that works for you. I welcome you to read my blog anytime and share any articles that are contradicting. Have a great weekend in the beautiful land of Germany. I went there as a high school student and love it! I loved this entry. I serve oatmeal to my children also, but my 3 year old recently started refusing to eat it. I’m glad to have different ideas to try. Have you seen those cinnamon chips they sell during the holidays? Those would be fun to mix in! I love cinnamon chips.. they would be delicious in oatmeal! Great idea! Wayne, why are you coming to this site with such an attack attitude? Amy has very mainstream ideas about healthy eating. Carbohydrates have been cultivated and eaten for 10,000. Obesity has really only been a growing problem within the past 50 years. Clearly you can’t lay all the blame on oatmeal. The point Amy was making was that processed foods is more of a culprit in the obesity epidemic so by eating anything that grows from the ground you’re probably going to get some nutritional benefits from it. The idea that you would lump oatmeal with poison ivy from that statement is absurd. What exactly are you trying to accomplish? Do you really think you’ve convinced Amy or any of her readers to read a fringe book on controversial eating theories? The only thing I wondered is why Amy didn’t delete your comments as abusive. If you feel so strongly about a no-carb diet then you should follow a blog that adheres to those principles or start your own. I read Superhealthykids because I adhere to most mainstream guidelines about healthy eating. I have read several articles about how fat is beneficial and saturated fat (such as the fat in dairy products) is not the killer it once was portrayed as. I personally focus on reducing added sugars, artificial dyes, and white flour. 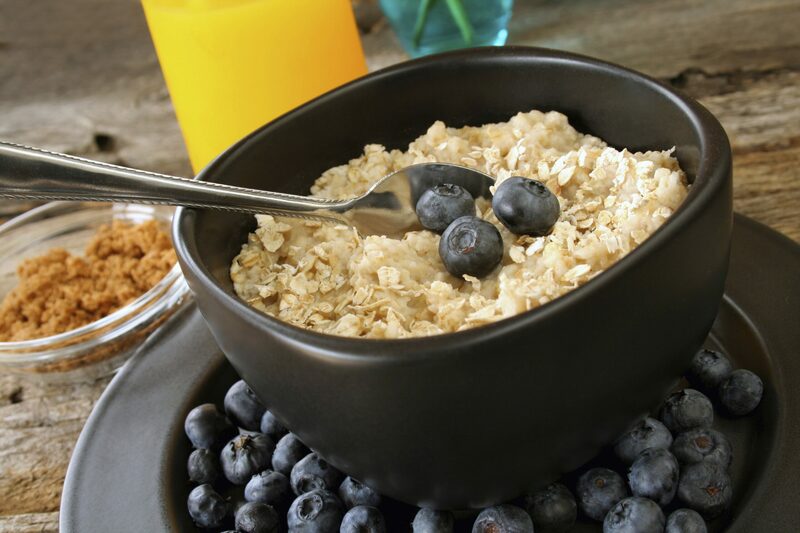 Mainstream science today states plenty of benefits for complex carbohydrates such as oatmeal. If in the future I decide to remove carbs from my diet I would still read this blog because Amy provides recipes for a variety of foods. If I wanted to persuade her against mainstream scientific theories about healthy eating then I would approach her with a little finesse. Sorry Amy, I hadn’t seen the comment till tonight. I wanted to let you know I’m a faithful (if sporatic) reader. To answer your question: I like to make oatmeal with half water and half milk. I use rolled oats and it makes the oats fluffy. Cinnamon chips does sound like a good addition. In fact, Amy regularly features various diets in her weekly meal plan. She addresses a Paleo eating style (which reduces carbs) here http://blog.superhealthykids.com/2011/07/gluten-free-paleo-meal-plan/. This tells me that Amy does read various articles and tries to stay current on other trends in eating. I appreciate her blog as well as her many other readers. Have you tried steel cut oats? It’s a different texture than regular oatmeal. The only way I can get my 9-year old to eat oats for breakfast (except in muffins) is when I mix in cocoa and vanilla in before cooking.